It's the 1st of the month which means it's time for another POM (Project of the month) over at WOJ. I totally forgot what with my sister over (she's home in sunny Florida now) until yesterday so had to rustle this up before I headed off to work. However, I should have more time now as I'm back to only working 3 days a week - whoohoo! Anyway, back to my POM, the theme is 'a valentines gift' and there are some absolutely stunning creations from the rest of the DT so be sure to check them out. Think mine is way too girly for me to give to my hubby so it's more a gift 'from the heart' (or I could give it to him to give to me, LOL)! 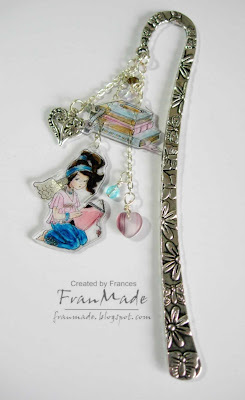 It's a decorated metal bookmark and I have made a card to hold it. Then I just cut 2 slits to slot my bookmark through. I bought these metal bookmark hooks from ebay end of last year when I was buying all my beading stuff and thought they would be fab to dress up. You just get the metal hook part which has a hole at the top for you to add your own chains/charms etc. I have been meaning to do this for ages so thought now was a good a time as any. I stamped 'melinda reading book' and the 'book pile' onto clear shrink plastic, coloured with my copics on the reverse side of the stamped image and a bit of stardust pen on her wings before carefully cutting around them leaving space at the top to punch a hole. I then used my heatgun to shrink them and you get instant mini plastic charms. Then all I did (but a tad fiddly!) 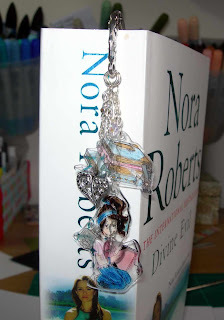 was add a jump ring through the hole and attach it to a length of silver chain, added some more beads and metal charms from my stash before attaching it to the metal hook and voila, one girly jingly bookmark! Excuse the book but it was the first one to hand! (yes, I've pretty much read all her books! )Ooo, can you see my fabby new pots in the background too?! That's what hubby put up for me when I rearranged my room last week just before my sister came to visit. So still need to sort bits out but will post some photos of before and after soon. Right, off to have some lunch then sort myself out so that hopefully I can do some blog hopping later to catch up with everyone and see what challenges are out there for me to take part in next week - yeah, happy days! 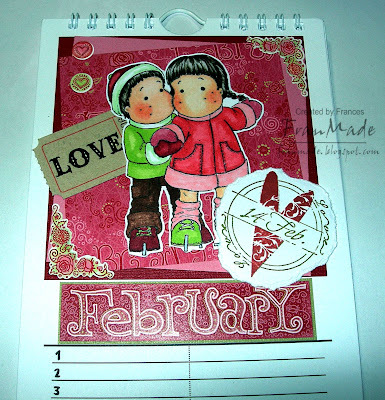 CCT theme this week is 'Valentine' and there are some fab stamps to be won this week so don't forget to hop on over for details. Having a lovely time with my sister which means my crafting is being neglected but as I didn't want to miss another week I managed to knock this one up using this hilarious High Hopes stamp. Fab thing is it only took seconds to colour in! long time no post! Sorry for my absence but I've got my sister visiting over from Florida this week plus I'm still half way through having a total re-arranging/clearout of my craft room! Will post some photos up once I've sorted myself out next week. Until then, this is just a quick scheduled post of my Tilda & Friends ATC which this week is 'no dp' so used a new quickcutz 'label' die and a cuttlebug embossing folder (script) for my background then just inked up this supercute Tilda from the new Valentine range which Silly Monkeys have in stock now here. Coloured with my copics and just a splash of clear stardust pen over the envelope for a bit of sparkle. Sorry for all the 'simple' creations recently but hope to get back to normal next week. Thanks for stopping by. CCT this week wants to 'have a giggle' so some sort of humour on your card. Well, I thought this would fit the bill, it makes me smile anyway (and so agree with the sentiment ;D)! No time for details but it's all pretty simply as no dp or embellies involved, just used an old CC designs set which hadn't seen ink yet (trying to rectify that this year! 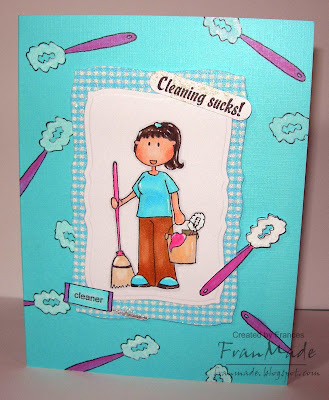 ), 'cleaning Queenie' and basic stamping and colouring with Copics (and a white 'Galaxy' marker from American crafts, from a set I got QVC - these are fab on dark coloured card). Image has been raised on foam pads for added dimension. Hope it raised a smile (I even made the sentiment 'dirty' looking by swiping 'old paper' distress inkpad over it, heehee!) Off to have my lunch now before back to the grind. Have a good 'rest of the week' and I'll try and post again this weekend, but can't promise! 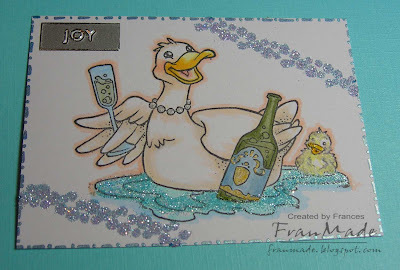 Tilda & Friends ATC: sticky duck! 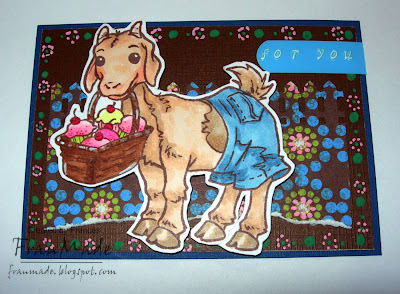 It's Wed again which means time for another ATC! 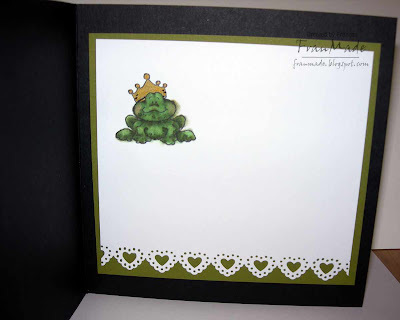 This week's challenge is to use something sticky on your ATC. 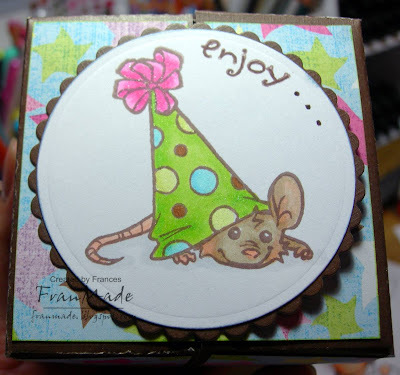 Here is my ATC using another party animal stamp from Whiff of Joy. Apart from the obvious peel off 'Joy' I also found some 'magic motifs' amongst my stash which are basically double sided sticky designs and you just add your own glitter/flocking etc (I've used a bubbly design border and have added blue glitter to it). Also for good measure I have used some stickles on the water and used my glue pen to add a coat of down (aka white fun flock) to the duckling after colouring him in yellow (might see better if you click on picture). Image has been coloured in with my Copics which I'm still trying to get used to all the different shades. Why is it, no matter how shades you have there's always one you don't have and need when you come to use them?!!! That's it. 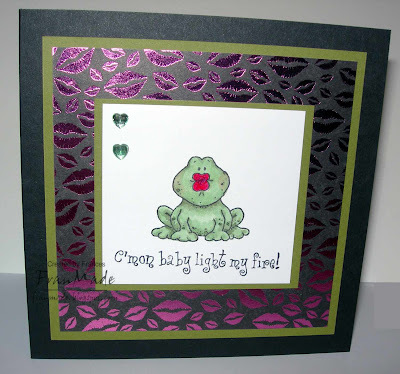 Another quick ATC which can be used as a card topper. Thanks for stopping by and hopefully see you Thurs if I ever get my CCT finished in time! Hello! Hope you had a lovely weekend. 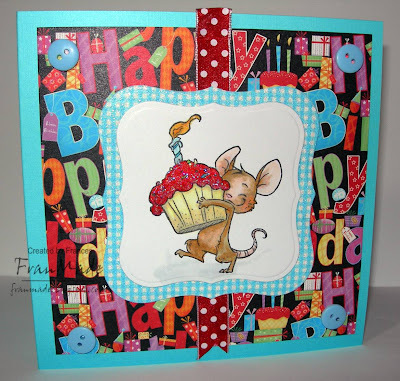 Managed to make 1 card with this cute Henry mouse for the WoJ challenge. I can see why he's out of stock (but he should be back in stock in a couple of weeks). I've kept it simple and bright as I think it suits these cuties more. Not much too it really, as the image is cute enough I think! Just a piece of DP (from an old Dovecraft 'birthday' paper pack), check glitter card, and blue base card, labels nestabilities, copics for colouring with stickles on the icing and some ribbon and 4 buttons. Right off to try and make the most of the rest of my evening off and make my DT challenge cards for this week and maybe do a bit of internet shopping too! 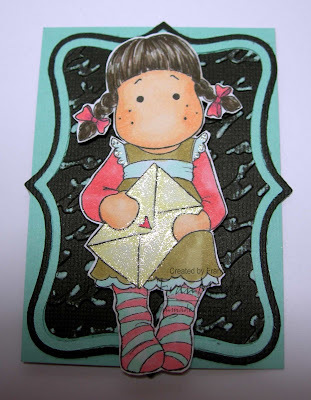 Talking of which, if you are a fan of the Elisabeth Bell range of stamps then you really must check out the stampkits Katharina has started to put together. 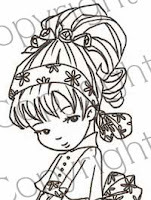 Here is a sneeky peek of one of the images in the first spring kit which has opened for pre-orders today. They are only available to order within the next 2 weeks so you won't want to miss out as the kit has 10 stamps at a fantastic price (6 main, 4 accessories stamps). You won't get to see all the stamps before you get them (that's half the fun I think) but you won't be sorry as I've seen them all and they are all just fabulous ;) ! Full details can be found here along with the chance to win a set! O.K you don't have to dash off quite that fast! 2. Colouring in (Copics/Promarkers are my fave at the moment, but do still love watercolouring with distress inks and also blending with my prisma pencils and sansodor too) ! Wheyhey, another nice easy challenge to ease back into over on CCT - simply to use something new you got over the christmas/new year period. So for me, nice and easy as the copic markers are new as are the 'love' ticket and the 'feb 14' seal stamp. 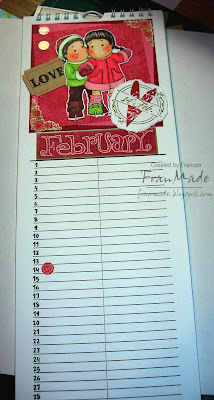 This is the second month of the calender I started back here and which I was supposed to have finished by now (but then hubby scuppered all my plans LOL.) My plan is to use all Magnolias throughout and I just had to use this pair of skating Tilda/Edwin for Feb as I think they look so romantic like that! Images: tilda couple skating from new year Magnolia range, feb 14 seal stamp from their valentine range. Here's a view showing the rest of the calender a bit better - still needs sprucing up but it'll do for now. 2 down, 1o to go! 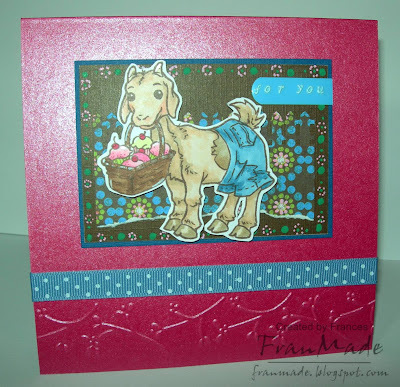 It's the 1st challenge of 2009 over on Tilda & Friends ATC and it's all things new. Not only is the theme 'new' but it's new rules too. No longer are you limited to certain brands of stamps. You can make your ATCs using any form of craft be it downloads, stamps etc as long as it is still 'cute' then that is fine. So for my 'new stuff' I have used my new copic ciao markers to colour in another one of my new super cute WOJ stamps from the party animal range. Also used some new galaxy marker pens I got off QVC over christmas to doodle the border around the brown ATC background - as you can see they work brilliantly on dark card. I have just cut the image out and mounted onto foam pads and added scrap piece of dp behind it with a punched out fence using my MS border punch. Hope you like it! Swing by tomorrow and I should have another post for the first CCT challenge of 2009. 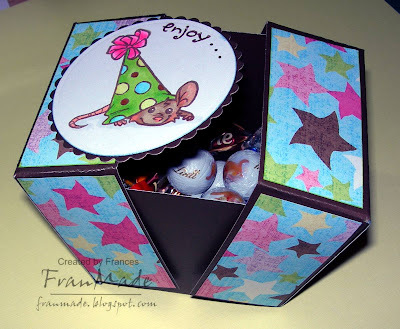 Just a quickie to show you another one of the fab new 'Alison Acton, Party animals' release from Whiff of Joy which are now available (I'm sorry I missed the launch party the other night on Papercraft planet but by the time I got back from work and showered, I'd missed the party! Oh well, next time ehh!). 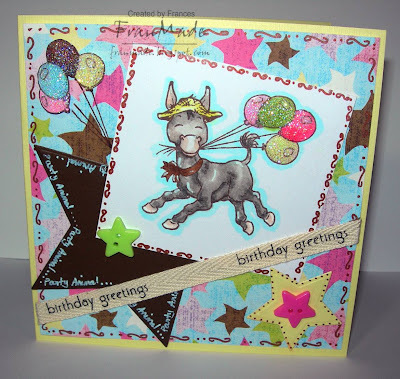 I've coloured this supercute donkey using my copics and added diamond glaze and glamour dust to the balloons (stamped and cut out an additional set for the side of the card) for added sparkle. I've used scraps of dp from my last project and just changed the base card colour to yellow and added cut out stars using my nesties, doodled round the edges with some galaxy markers I got off QVC (they are great on dark card), a bit of ribbon and buttons and that was it. Will try and join in some challenges again soon and hopefully that will kick start the mojo but for the time being it's just a case of 'throw it together and let's see what we have' type of card making! Should have a couple more posts for you this week as both Tilda and friends and CCT are back on this week. Until then, have a great week and hope you're all getting back into 'normal' mode/routines soon. I'm off out to do a spot of retail therapy seeing as it's my one day off and then hope to do a spot of catch up/crafting later tonight. Hope you all had a lovely time seeing in the new year whatever you were up too and were wrapped up warm . . not being well, I was ultra boring and just watched all the fireworks/celebrations on TV whilst snuggled up in bed :). 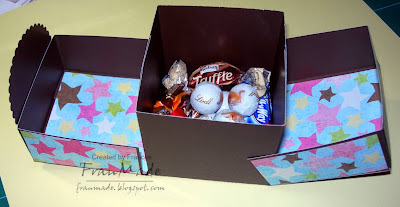 As promised, here is my Whiff of Joy 'Project of the month' which this month is 'creative packaging for chocolate'. So I rummaged through some scorpal projects and saw this cute origami box which looked easy and fun ! 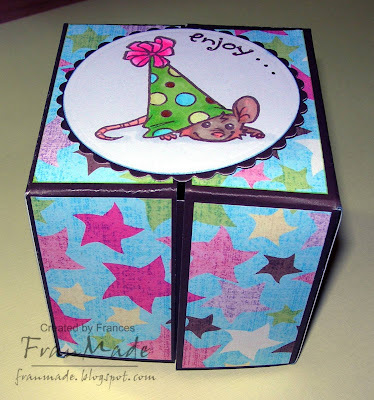 I also used one of the new upcoming releases from WOJ, 'party animals' by Alison Acton. Love this cute mouse, so quick and easy to colour in. If you love this cute mouse then you need to stalk WoJ on the 3rd Jan which is when they will be released. There are lots of other cute images and all are as fun and quick to colour in (great for quick fuss free cards and gifts but still look great). For further sneek peeks check out the other DT's blogs which you can find on my side bar or over on the WOJ website. Also, there will be a release party over on the WoJ group on Papercraft planet tomorrow night (2nd Jan 11pmGMT). I will try and pop in after I get in from work.